This year I wanted to get more into the celebrating of Cinco de Mayo. I've really had a craving for Mexican (tex-mex) food the last year or more and I wanted to get in the spirit of it. My sister-in-law is from Mexico and I've been asking her for food ideas. She recommended some cook books by Rick Bayless. My brother bought me one of his cookbooks. That was a nice surprise. The celebration didn't go like I thought it would since I've been fighting a cruddy cold for about 1-1/2 weeks. We opted to eat at Hacienda for dinner. (We were bad and didn't take the camera to the restaurant with us. Nothing fun happened. I thought they might give out something for the kids but they didn't even have a special or anything. What a let down. At least the food was good.) This afternoon I made a flan for dessert. I tried talking Mattey, who's turn it was for activity for FHE, into doing a Mexican hat dance but she didn't want to. Oh well. After FHE we had the flan. Let me just say I really, really don't like cooking for my picky eaters. I was the only one that ate it. So if anyone wants some flan let me know. I thought it was good, especially for my first one. Here's the picture. I don't think there's supposed to be flakes of the custard in the caramel but like I said it's my first one. Nice work on the flan! 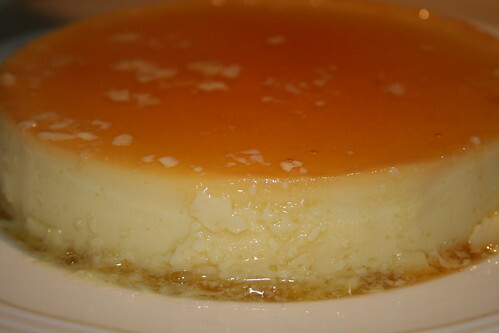 Mark loves to make flan, and we know how time consuming it can be. If it makes you feel any better, on Mark's first time making it, he used a plastic spoon to stir the sugar while it was trying to melt, and it melted right in with the sugar. It took him a minute to figure out why more white chunks were appearing instead of disappearing. We've learned the beauty of wooden spoons for that tricky part. Did you have to bake it in a water bath, too? This makes me hungry just thinking about it! To defend myself a little (not saying that I'm not one of the problems) but I didn't feel well last night or I would have tried the flan. I did have to use a water bath. I also had to bake it about 20 minutes longer than the recipe said. I don't know if it was the oven or maybe the recipe was wrong because it couldn't have been me. My recipe says to swirl the sugar in the pan. So I stood there for maybe 15 minutes swirling the pan waiting for the amber color to appear. I'm glad I didn't have a melting problem, I probably would have given up right away. I also had to buy a soufflé pan so now I can make a soufflé. I've never even had one before. Anyone have a good recipe? Sweetie, I'm sure you won't like, mostly because of the texture. The texture is definitely unique. And we had to bake ours an extra 20-30 min for the toothpick to come out clean, but then my Mexican sister-in-law said to take it out before the toothpick is clean, and it won't be so rubbery. I've never done a souffle. Keep us posted! The knife I inserted came out clean and I didn't have a rubbery texture. I think it's a pretty good texture. Do you let yours cool in the water bath? My recipe said that's when it sets. Maybe that would make a difference. I don't think we cooled ours in a water bath. I'll have to try that next time, though. It's amazing how rich flan can be. I forgot to say that after cooling it in the water bath I then put it in the refrigerator. I'm sure you know that part already. And I think the flan tasted better the second day. It could just be me. looks good to me. I'll eat just about anything. hehe. I ate almost the entire flan. I have no self control. I had to throw the last piece away so I wouldn't eat anymore. I have to print a retraction. My sister-in-law is not from Mexico but her mother's side of the family is, she's from Texas. Sorry Mary.